Our June WiN meeting is Thursday, June 4th. 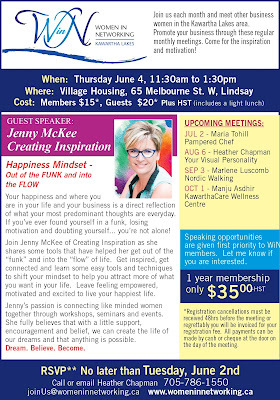 We have a special guest speaker, Jenny McKee from Creating Inspiration. She will be talking about your Happiness Mindset - Out of the FUNK and into the FLOW.Full details below. Please register by sending me an email by Tuesday, June 2nd. I look forward to seeing everyone!